A review of different variants and names of Ranking Losses, Siamese Nets, Triplet Nets and their application in multi-modal self-supervised learning. Magenta Neural Style Transfer is trained to transfer the style of different paintings by Joan Miró. DeepDream is applied on models trained with #joanmiró data to visualize which visual features a CNN learns from those posts. Using the Google DeepDream algorithm on models trained with #Barcelona Instagram data to visualize what the users (and the CNN) highlight from the city. We learn relations between words, images and Barcelona neighbourhoods from Instragram data. We split the dataset by language and analyze what locals and tourists posts about the different Barcelona neghbourhoods. A performance comparison of different text embeddings in an image by text retrieval task. A multimodal retrieval pipeline is trained in a self-supervised way with Web and Social Media data, and Word2Vec, GloVe, Doc2Vec, FastText and LDA performances in different datasets are reported. A dataset of social media images with associated text formed by Instagram images associated with one of the 10 most populated English speaking cities. A review of different variants and names of Cross-Entropy Loss, analyzing its different applications, its gradients and the Cross-Entropy Loss layers in deep learning frameworks. Applying algorithms to learn from images and associated text to Barcelona Instagram images lead to interesting results for the tourism industry, which I presented in ForumTurisTIC. Jan 12, 2018 What Do People Think about Barcelona? A joint image and text embedding is trained using Instagram data related with Barcelona. It is shown how the embedding can be used to do interesting social or commercial analysis, which can be extrapolated to other topics. Training a fully convolutional network to perform pixel level segmentation of faces and hair. Benchmarking of different data augmentation techniques to train a CNN for image classification. Does data augmentation help to get a model that generalizes better? SetaMind is a simple Android application: You take a picture of a mushroom with your phone and the app identifies the species and provides information about it. To identify the species it uses a classification CNN that runs locally in the phone. An ImageNet-like competition but training with noisy data collected from the web. Notes about training a GoogleNet from scratch in a cluster and about how to combine images, noisy labels and associated text to train a classifier. 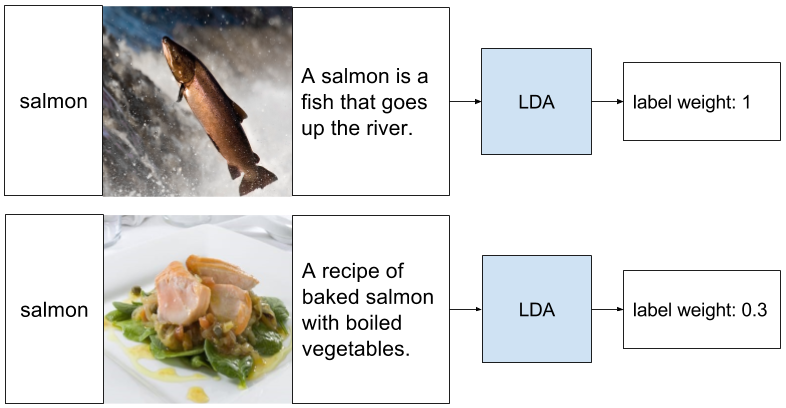 A LDA and a CNN are used to embbed the ingredients lists and the food images respectibly in a topic space. The CNN can predict topic distributions from food images, and from the topic distribution we predict the ingredients. Learning of a joint embedding of text and images using InstaCities1M. A LDA and a CNN are used to embbed text and images respectibly in a topic space. Then a retrieval by text system is built and tested. Construction of InstaCities1M, a dataset of Instagram images associated to a city and training of a CNN that learns to classify images betweeen the different cities. A simple experiment to show how social media data can be used to learn. Computer vision, deep learning and image processing stuff by Raúl Gómez Bruballa, PhD student at Eurecat and CVC (UAB), Barcelona.